Reduce, reuse, recycle! Everyone knows the mantra, and we’ve got the right recycling containers, metal recycling bins, and plastic recycling bins to help you take care of our planet. Especially now, more things can be recycled than ever before, so having the right recycling receptacles for glass, aluminum, and paper, as well as other materials, like electronics, can go a long way in making your office, home, or industrial space cleaner. We have the recycling bins for sale that you need. Especially now, more things can be recycled than ever before, so having the right recycling receptacles for glass, aluminum, and paper, as well as other materials, like electronics, can go a long way in making your office, home, or industrial space cleaner. We have the recycling bins for sale that you need. And we don’t just make small ones. We have bottle large recycling bins, recycling containers, large commercial recycling bins, commercial recycle trash cans, and side by side trash recycle bins. Starting a good recycling habit doesn’t have to break the bank either. We have cheap recycling bins for sale, as well as metal recycling bins for sale. Make sure to browse below and see what sales we have on offer currently. Don’t hesitate to send us an email with any questions you might have. Let’s work together to have a more organized, cleaner, and greener planet! Have a look at our wide selection of large commercial recycling containers, aluminum can recycling containers, metal recycling containers, and steel recycling bins. All of our commercial recycling receptacles are offered at low prices and high levels of quality. If you're looking for where to buy trash recycling containers or just a metal garden bin, you will find what you need at Trashcans Unlimited. We invite you to click on any link or picture to find detailed information on all of our products. We care about a cleaner, more efficient planet here at Trashcans Unlimited, and a proper recycling solution is a key part of that. Waste that ends up unnecessarily in a landfill isn’t a good thing, and we’re always working to make sure that we have products that can stand up to everyday use as well as providing an efficient solution to the waste problems of today. Frustrated with cheap trash cans that don’t last? Our affordable and high quality trash can warehouse has you covered. We have a huge selection of indoor trash cans and outdoor trash cans to fit every need. Our cans are also designed for different aesthetics and decor styles, so if you need recycling bins for a indoor space, or something nice for the garden, we have what you need. Our online store offers low prices on high quality trash cans, waste receptacles, recycling trash cans for home and the office (commercial rubbish bins if you’re over in the UK), bulk recycling bins, and metal and plastic ashtrays, and we constantly have different products on sale! 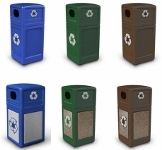 Take advantage of our wholesale pricing on commercial trash cans for business and the home. Get in touch with us if you have questions.